This sale is huge. We have clothing, home and office furniture, antiques, crafting items, books, kitchen wares, small appliances, toys, exercise equipment, tools, linens, camping gear. LARGE APPLIANCES, SKIS, CARSEATS, MATTRESSES, ENCYCLOPEDIAS, or TOILETS. We can't help you if we can't find you! Is your address visible from the road? Firefighters often struggle to locate a home due to a lack of a visible address at the road. 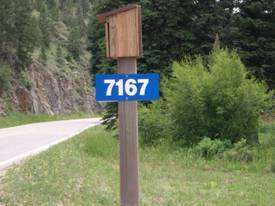 Is your home's address easily visible from the road? 1. Is the numbering and lettering large enough to be read from a vehicle at night? 4. Is the sign raised above ground to avoid being buried in snow? 5. Can the sign be viewed as firefighters approach your home rather than visible only directly in front of the driveway. Help us to help you. Make sure firefighters can find your home quickly. Here is an example of a reflective sign provided by Inter-Canyon Fire Protection District. You can request a sign by calling non-emergency office at 303-697-4413.
he fire shelter is a mandatory item of personal protective equipment for all wildland firefighters and must be arried on the fireline by everyone on Federal wildland fires. State, local, and rural fire departments may have different policies regarding the fire shelter’s use. Inter-Canyon Fire Protection District requires all wildland firefighters to carry a shelter. 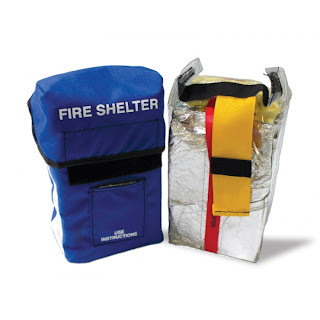 The fire shelter has been required equipment for wildland firefighters since 1977. Since that time, shelters have saved the lives of more than 300 firefighters and have prevented hundreds of serious injuries. A new generation of fire shelter now offers improved protection from both radiant and convective heat. Even so, the shelter will not protect firefighters under all fire situations. The fire shelter should be used as a last resort if planned escape routes or safety zones become inadequate and entrapment is imminent. Carrying a fire shelter is not considered an alternative to safe firefighting. The new generation fire shelter protects primarily by reflecting radiant heat and trapping breathable air. The new shelter has two layers. The outer layer is aluminum foil bonded to woven silica cloth. The foil reflects radiant heat and the silica material slows the passage of heat to the inside of the shelter. 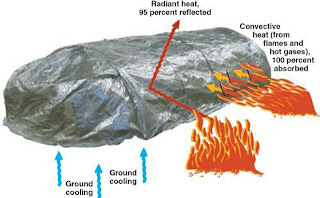 An inner layer of aluminum foil laminated to fiberglass prevents heat from reradiating to the person inside the shelter. When these layers are sewn together, the air gap between them offers further insulation. Deployment of the shelter can be difficult even int he best conditions. High winds can whip the shelter in the wrong direction, temperatures are increasing rapidly, little to no light, and the need for a safe area for deployment are all challenges. Thanks to a great Inter-Canyon crew for their all-day work on the Bear Gulch Fire. Great job. New photo of Bear Gulch Fire. You can see the retardant painted by fixed wing aircraft on the east side of the fire. Firefighters faced challenging terrain to access the fire. 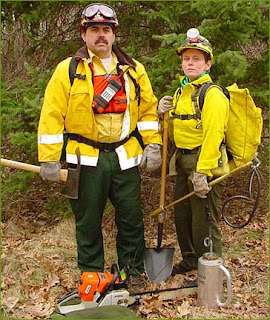 Inter-Canyon firefighters wear wildland gear designed for wildfire environments. The firefighters on the Bear Gulch Fire are equipped with protection gear very different from traditional structural firefighting gear. The gear includes Nomex shirt and pants, helmet, gloves, eye protection, heavy boots, and airway protection. Typical wildland firefighting gear. Crews remain working at the Bear Creek Gulch Fire. Working on perimeter fireline. Rocky and steep terrain. Six Inter-Canyon firefighters led by a Crew Boss are working the fire. These firefighters have completed the Federal National Wildfire Coordinating Group (NWCG) S130/190 course and many have advanced training. The Inter-Canyon crew on scene at the Bear Gulch Fire is working on establishing a fireline around the perimeter. You may see smoke from the interior of the fire, small fuels still burning. The fire is not at risk for growth. The Inter-Canyon Crew Boss working with the hand crew says the fire is approximately 200 feet x 100 feet in size on the rock wall. Cause of the fire is lightning. Inter-Canyon firefighters are on scene at the Bear Gulch Fire. Firefighters identified a shorter access route and are now assessing the fire. Access is difficult as the fire is on an 80 ft rock wall. Firefighters will determine the extent of any fire growth and best way to create fireline.